The price of gold is roughly constant. I ignore the 2008 spike. The constant means that you can buy as much gold per your dollar as you could a year ago. Yet, the dollar is cheaper today, so, the gram of gold must also be cheaper. The plot shows me that gold loses its value as much as the dollar and other printed currencies, it is subject to inflation. It shows that the gold value is eaten at the printed money inflation rate or gold is mined exponentially with time at money doubling rate. Is my observation right? The general argument put forward by gold lovers isn't that you get the same gold per dollar (or dollars per ounce of gold), but that you get the same consumable product per ounce of gold. In other words the claim is that the inflation-adjusted price of gold is more-or-less constant. 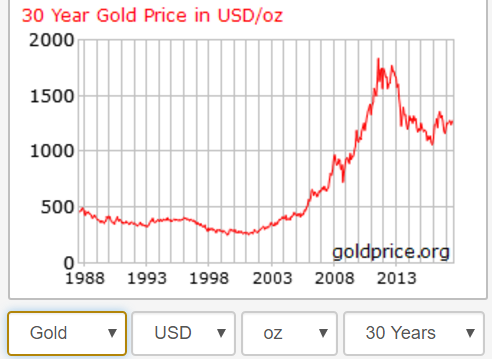 See zerohedge.com link for a chart of gold in 2010 GBP all the way from 1265. ("In 2010 GBP" means its an inflation adjusted chart.) As you can see there is plenty of fluctuation in there, but it just so happens that gold is worth about the same now as it was in 1265. See caseyresearch.com link for a series of anecdotes of the buying power of gold and silver going back some 3000 years. Gold isn't constant in value. If you look at the high price of $800 in January of 1980 and the low of $291 in 2001, you lost a lot of purchasing power, especially since money in 2001 was worth less than in 1980. People claim gold is a stable store of value but it isn't. Gold is a risky and volatile investment. If you want an investment that's inflation-proof, you should buy index-linked government bonds in the currency that you plan to be spending the money in, assuming that government controls its own currency and has a good credit rating. No. If you have to ignore a price spike, obviously its value is not constant. Gold is a commodity, just like every other commodity. Not the answer you're looking for? Browse other questions tagged inflation gold or ask your own question. How fast does the available amount of gold in the world increase due to mining? Why doesn't Graham consider gold as an investment?